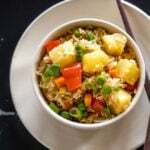 Looking for a quick and easy meal? Then you have come to just the right place! 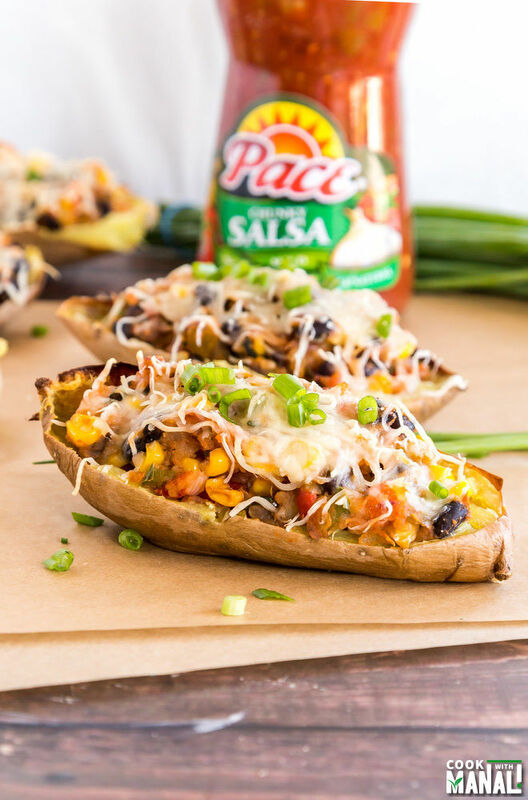 These Vegetarian Sweet Potato Skins are loaded with veggies and the use of Pace Salsa really kicks up the flavors of this dish! Eat this as an appetizer or main course. When you are a food blogger, grocery trips happen every now and then. No, we can’t restrict them to weekend because that would be way too less. Plus it happens so many times, that you are in the middle of a recipe and you realize that you are missing an ingredient so you have no choice but to make that quick grocery trip. I have lost count of how many times a week I drag my poor husband with me to do groceries. Seriously, it’s like I want 2 new ingredients everyday! Anyway so during one of my grocery trips last week at my local Safeway I spotted sweet potatoes. And suddenly it dawned upon me that in between all the pumpkin and apple madness, the poor sweet potatoes were being neglected and that was just not fair. I mean something as delicious as sweet potato should never be neglected. Right? While shopping at Safeway, I also came across this awesome Stock Up Sale on Pace Salsa. For someone who does so much grocery shopping, you can imagine the excitment on stock up sale! 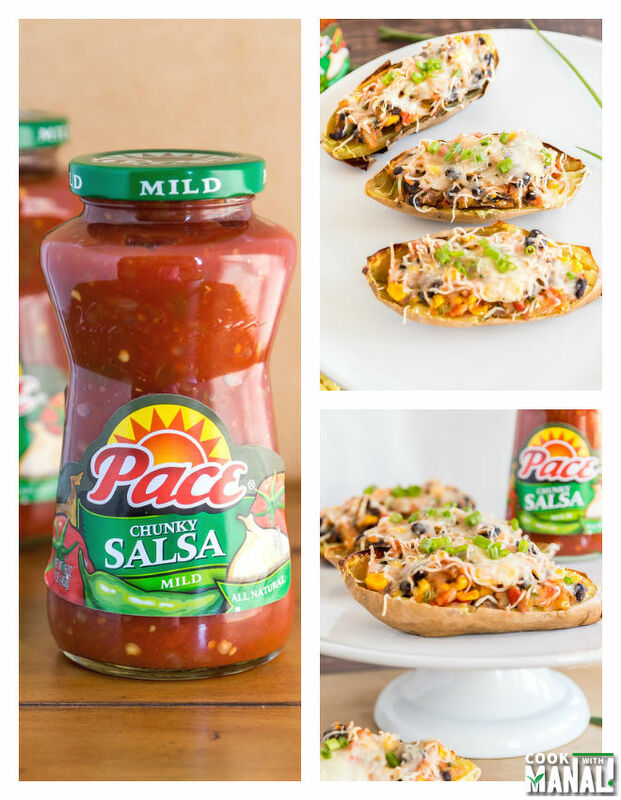 I love Pace Salsa, it’s so versatile. I eat it with some chips on the side, add it to my tacos and even to my rice sometimes. So I was definitely not going to miss on this sale. And this time around I added it to these sweet potatoes and made loaded vegetarian sweet potato skins. They turned out super delicious! Adding Pace Salsa to this dish really kicked up the flavor! 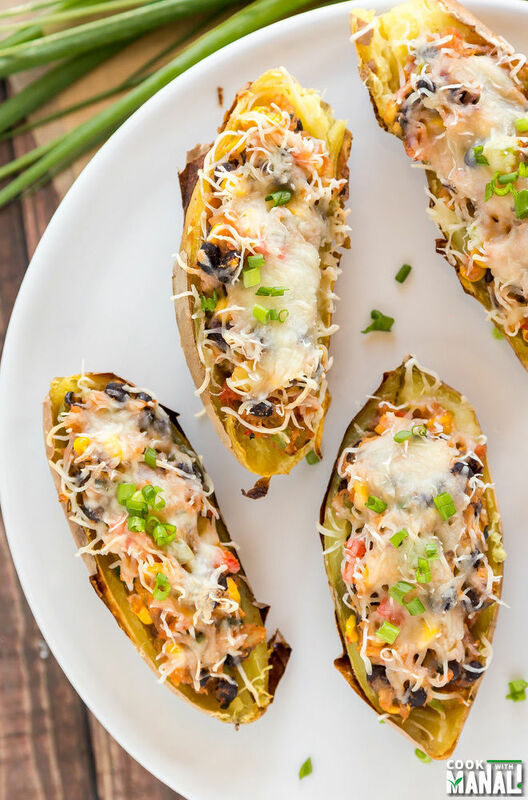 What I love about this vegetarian sweet potato skins is that it doubles up as an appetizer and a main dish. It’s also great for game day snacking! I made this as a snack the other day and refrigerated the left-overs and we had them for dinner the next day. 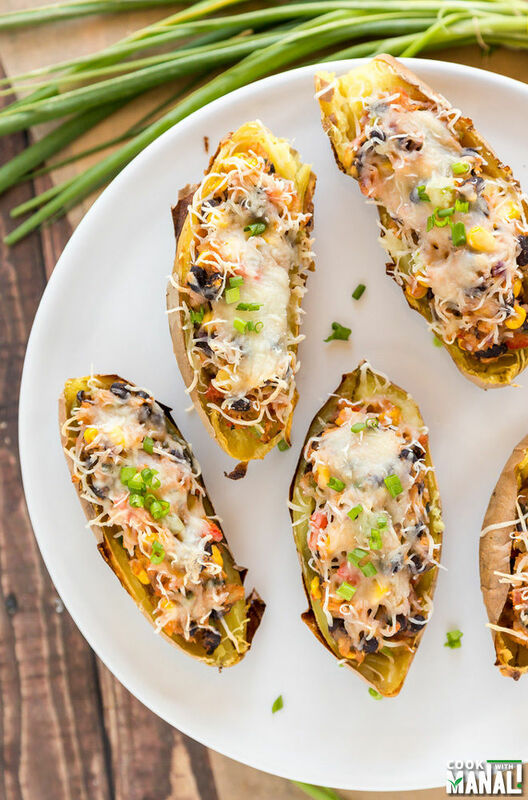 You guys know how much I love veggies so these sweet potato skins are really loaded with beans and veggies. It is for this very reason that I didn’t add any sour cream, cream cheese etc. to the filling. I like the taste of veggies and salsa and didn’t want any cheesy taste to overpower it. I added black beans, onion, green pepper, corn, red pepper, scallions and cilantro to these skins. You can use whatever veggies you like. 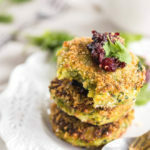 I would have totally used spinach but I didn’t have it in my refrigerator when I made these and I was definitely not ready for another grocery trip! 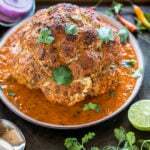 I hope you give this recipe a try and enjoy it as much as we did! Place sweet potatoes on a baking tray. Prick them all over with a fork and put in the oven at 400 F degrees for 40-50 minutes. You can see the size of the sweet potatoes that I used in this recipe. The smaller ones were done in 40 minutes while the bigger one took around 50 minutes. While the sweet potatoes are in the oven, prepare the filling. Heat vegetable oil in a pan on medium heat. Once the oil is hot, add minced garlic and chopped onion to the pan. Saute till the raw smell goes away, around 2-3 minutes. Now add the beans (drained from the can), sweet corn and peppers to the pan. Mix and cook for a minutes. Add chopped scallion and cilantro, add salt and cook another minute or so. Remove from heat and set aside. Meanwhile prepare the stuffing. Transfer the sweet potato flesh to a bowl and mash it well. To this add the prepared veggie mixture. Mix till well combined. Add Pace salsa to the mixture and mix. 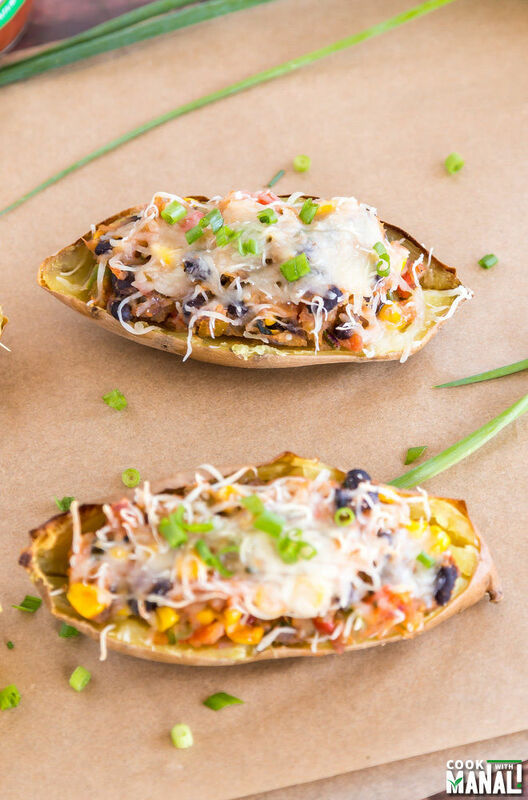 Take out the sweet potato skins out of the oven after 10 minutes. Fill them with the prepared veggie mixture. Top with shredded mozzarella cheese and put back the tray in the oven till cheese melts, around 10-15 minutes at 375 F degrees. Garnish with some chopped scallions and serve immediately. You can also put some sour cream on top! YUM! 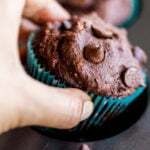 * If you want some creaminess in your filling, consider adding cream cheese, milk or sour cream. * You can use any other cheese or a cheese blend of your choice. And don’t forget to take advantage of this Stock Up Sale at Safeway. 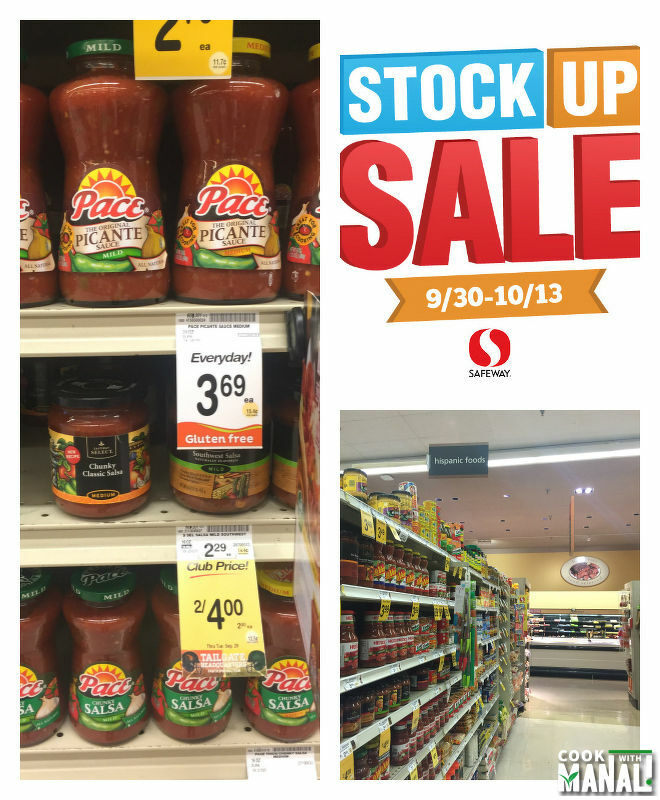 Stock up 16 oz Pace Salsa – 2 for $4 at your local Safeway from 9/30-10/13. And now tell me what’s your favorite way to eat salsa? 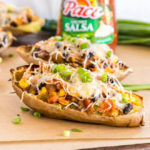 Loaded Vegetarian Sweet Potato Skins filled with beans, pepper, corn, salsa and onions makes a filling and delicious meal. It's also great as an appetizer! Place sweet potatoes on a baking tray. Prick them all over with a fork and put in the oven at 400 F degrees for 40-50 minutes. While the sweet potatoes are in the oven, prepare the filling. Heat vegetable oil in a pan on medium heat. Once the oil is hot, add minced garlic and chopped onion to the pan. Saute till the raw smell goes away, around 2-3 minutes. Now add the beans (drained from the can), sweet corn and peppers to the pan. Mix and cook for a minutes. Add chopped scallion and cilantro, add salt, cayenne pepper and cook another minute or so. Remove from heat and set aside. Once the sweet potatoes are done, allow them to cool down a little and then slice them in half lengthwise. Scoop out the flesh of the sweet potatoes but remember to leave a thin layer inside so that the potato skins can stand on their own. Wow! 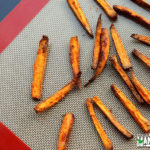 Love sweet potatoes and loving this quick and easy meal. Lovely share, Manali! These sweet potatoes look amazing, Manali! I love how you made them vegetarian. The flavor sounds just perfect! I adore sweet potatoes. These look very satisfying and delicious. Thank you Angie, sweet potatoes are my favorite too! Wow, these look great. Love the southwestern spin. I could happily chow down on these! Sweet potato and salsa are 2 of my favourite things, so this sounds perfect to me! Yum! I agree with you (always! )…we should never neglect something as delicious as a sweet potato! And what you’ve done with it is the exact opposite! Such care you’ve shown. I love it!! I’d choose sweet potato over regular every day of the week! These look phenomenal, Manali, and that I love that filling! Love this southwest take on sweet potatoes, Manali! 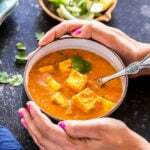 Not sure about others, but I’m huge fan of sweet potato and love love using it in cooking. 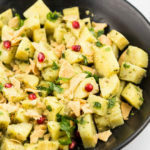 We’ve been making something similar to this- so easy, so healthy and absolutely delicious!! Love this version! I have some sweet potatoes ripening in the garden and I think it would be perfect. This sounds fantastic!! 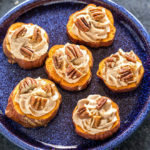 I love sweet potatoes especially when they are made with a Mexican spin! Yum! Sweet potatoes are a favorite but I’ve never thought to prepare them this way! I love it! !